No matter what your deck is built from, it will require deck repair and maintenance through the years to look great and perform as it should. Some materials need more TLC than others. This guide provides information on just how much work you’ll need to do and how expensive repair and maintenance will be in the years ahead. It makes sense to look at the 15-25 year cost of a deck, not just the upfront cost of the materials and installation. As a general rule, the more the deck costs initially, the less it will cost over time, and vice versa. Some exotic woods can be exceptions – they cost more upfront and they have to be cleaned and stained/sealed regularly, adding long-term cost too. There are principles of good deck maintenance that apply no matter what your deck is made from. 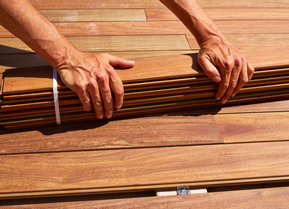 Below, we’ll offer advice for caring for each of the most common decking materials. Sand and dirt act like sandpaper on the surface of your deck when it is walked on. The debris will wear through the sealer on a wood deck, making the wood susceptible to moisture, its worst enemy. Sand will mar the finish of a composite or aluminum deck, diminishing its good looks. Use the method of your choice to remove damaging material. A broom is cheap and easy. A leaf blower or compressor will do a good job. Water from the hose is effective, but constantly wetting a wood deck isn’t a good practice. We recommend removing the dirt “as needed” because only you know how often this is necessary. If you live on the waterfront, and sand and dirt are tracked from the beach to the deck often, you’ll need to remove it often. When you’ve got a lush lawn surrounding your deck, less frequency will be needed. Check with the deck installer for the exact frequency. It will depend on the material, your climate and the specific conditions of your property. For example, if it rains a lot where you live, and your deck is in a shady location, algae and mold will be a greater potential problem than they would be in a dry and sunny setting, and you’ll need to remove them more frequently. Clean up BBQ sauce, grease drips, wine, house paint, etc., before it can seep into the cedar, pressure treated, composite, redwood, ipe or other type of porous decking. Time is definitely of the essence, so act quickly, especially if the spill occurs in a high-traffic area where the sealer might be worn. The spring and fall seasons are good times to look for and repair damaged planks, loose fasteners, loose stair treads and other problems. Shovels, especially metal shovels, can be hard on any type of decking. When UV inhibitors and algaecide are included in the product you use, the stain will more effectively protect and preserve your wood deck. Here are specific deck care and maintenance tips for the most popular deck materials. For more details, see our individual deck guides for each material. Note: More than half the cost of refinishing a deck is in labor, so if you do it yourself, your cost savings will be significant. Be sure to use a pH-neutral detergent to avoid reaction with the metal. Feel free to use a hose for dirt removal, since water won’t harm aluminum. If the deck hasn’t been built yet, make sure the deck planks have sufficient room between them to allow for water drainage. Stain and seal the deck within a few weeks of installation. Avoid using mats, if possible, and move planters frequently to prevent water from being trapped against the deck for any length of time. Broom away snow to avoid scratching the wood rather than using a metal shovel. Annual cleaning with a neutral cleaner and stiff brush is ideal. If food or other debris is stuck on the deck, soften it with warm water and mild detergent before gently scrubbing it away. 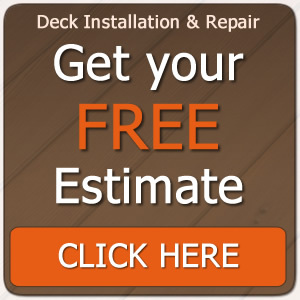 Seal the deck within a few weeks of installation. If you use a mat on the decking, it should be made from inorganic material that won’t absorb and hold water. Move the mat and planters frequently to avoid water saturation of the deck. The deck should be sealed within six weeks of installation when it is thoroughly dry. If the wood feels wet from the pressure treating process, wait until it feels dry. Use water and mild detergent on stains and dried debris rather than harsh cleaners or metal tools. Wait about one month to stain or seal unseasoned redwood. If a few drops of water are absorbed into the wood within a few minutes, it is ready to stain/seal. Lightly sand the wood prior to staining or sealing to “open” the pores to better receive it. A penetrating sealer should be used for best results. Do not use varnish or polyurethane sealers on redwood; an oil-based product will preserve the wood much better.